Newspapers have gone digital as each and every one of them provide e-paper and online news website services. Digital media has become an integral part of modern society and a potential challenge to the print media. Since the number of people who are using Internet is increasing day by day, the challenge will be going high in coming years. 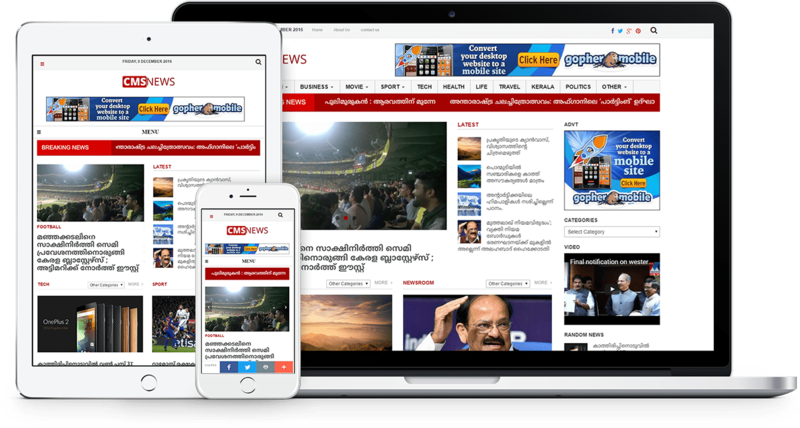 News portal design and development needs more careful thought and planning in this era of digital news revolution. But you have an option here; only if you want to exist and stay strong in the online news market. Without an impressive, captivating, creative, user-friendly, and content rich design, your news portal website may vanish in a near future. The best online news portal designs have a lot distinctive features and characteristics. If you want your news portal design attract more readers and reach out to the larger audience, the following 12 features will lead you the way. Online news portal development should provide readers with the possibility to customize their hope page giving them the power to choose sections, contents, topics of their interest. If the design fail to offer this personalized reader experience, visitors are more likely to leave the portal looking for some others which offer them that. This is another important distinctive feature of an awesome news portal website development. Instant breaking news updates with unfolding stories of popular interest are powerful enough to keep the portal dragging readers all the day. If your portal is the one which brings breaking and shaking news to the readers in the first place, then they are more likely to visit your news portal looking for something that shake them. News portal development is a work of creativity as well. Creating the portal or website with a stylish and up-to-the-minute design is an absolute process of art and creativity. You have to know the audience and design for them. I have many online news apps on my mobile and I go for the most attractive one. I believe most of the readers also tend to do so. Every successful news portals that I have come across have beautiful and impressive style. News portal designs which are easy to navigate are more likely to be visited by readers than those without it. The navigation menu should be simple and in the right position. Most news websites put their primary navigation menu just below the header and above the content. Some others use left side bar as well. Both these positions are easily seen by the visitors. In news portal development, readability is the most important feature. Most news portal websites use dark text on a white background. The contrast of colours facilitates the readability of the content and that is why ‘black on white’ scheme is the most suitable for news portals and websites. If the content in your portal is not readable, visitors are going to hate your portal for sure. So, keep in mind that contrast in colours is a must. In today’s world, online news portals or websites cannot even exist without social media integration. Excusive and breaking news spread more on social media like Facebook and Twitter than news portals. By integrating with social media, news websites can reach to a large audience in a blink of an eye. Reader comments and engagements are critical elements for good news portal designs. Unlike newspapers, today, digital newspapers act more as social networks. Many of the readers want to express their views on particular issues, like or dislike some opinions, and somehow raise their voice. Then, better you provide them with a space. News portal developers must note this very distinctive feature; responsive design. A responsive news website design makes your portal look nice on the screen of any device from laptops, tablets, and mobile phones. It enables the readers to access your content and view it the way they love to do. Frequent content update is essential for the existence of your news portal. Without frequent updates your website will not attract the audience. Frequent content effects your results in search engines as well. If more people visit a website regularly then more likely Google like it. In news portal development, monetary features are as important as content and service features. Integrating advertisement in the right part of the design is crucial for the monetary benefits of the news portal. You must be able to use ads without turning readers away from your website. The right places for banner ads are sidebar, both left and right, header or footer. News portal websites are commonly built with grid-based designs. This design is a popular choice not only because of the sharp and impressive look it creates but also it is one of the most effective ways to manage and organize a large amount of content. The grid-based design allows you to break the content into comprehensive blocks; thereby engage users to read your content. Don’t try to fill all the white space with your content and bore the readers. Embracing maximum white space is important to show the reader where they should focus their attention. White spaces are what make your website more readable and simple, even though it is filled with an excessive number of content items. The distinctive features of a best news portal design are not limited in these twelve. There are still more as I have mentioned only few which are unavoidable. How To Create A WordPress Website Easily With These Simple Steps?